Truth to be said I made these for a DELICIOUS paneer dish I made and of course I think a creamy paneer dish need some kind of roti to go with that than rice. I was in a mood to make some thing new. Sieve together flour and salt. Rub in 2 tbsp of ghee. Slowly add water . 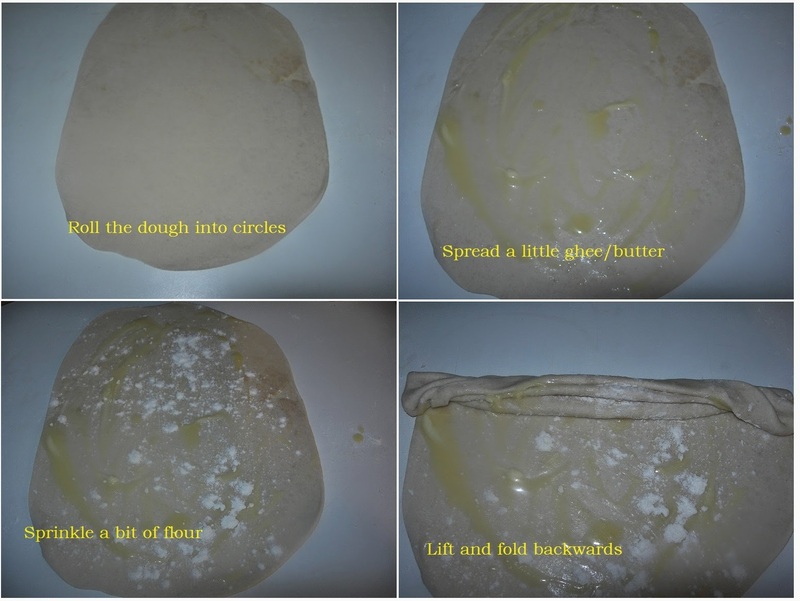 Knead to a smooth and pilable dough. Take one dough ball and flatten it with you palm. 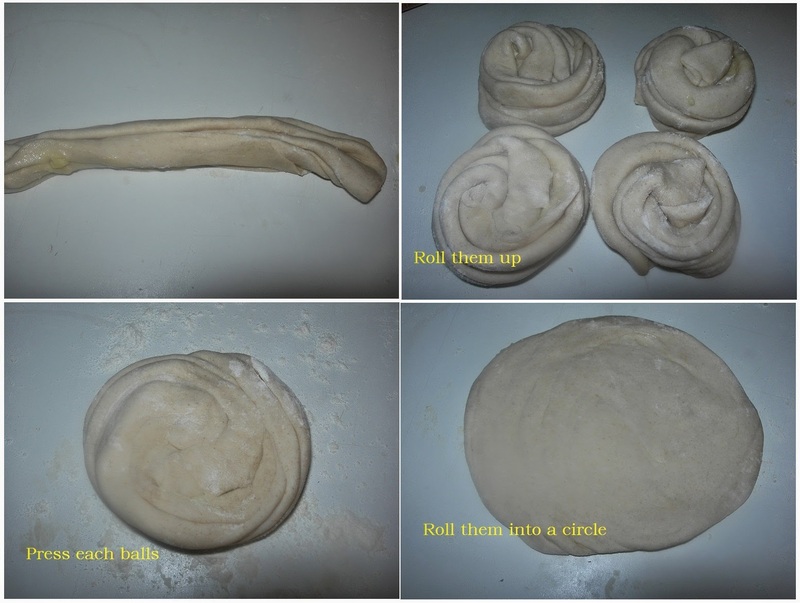 Roll the dough into a circle shape. Now spread 1/2 tsp ghee ever entire circle and sprinkle 1 tsp of flour over it. Roll into a swiss roll, prepare the remaining balls the same way. Now take a ball, flatten with palm and roll into a round disc. It should not be very thin or very thick , medium thickness it should be. Heat the griddle iver medium heat. 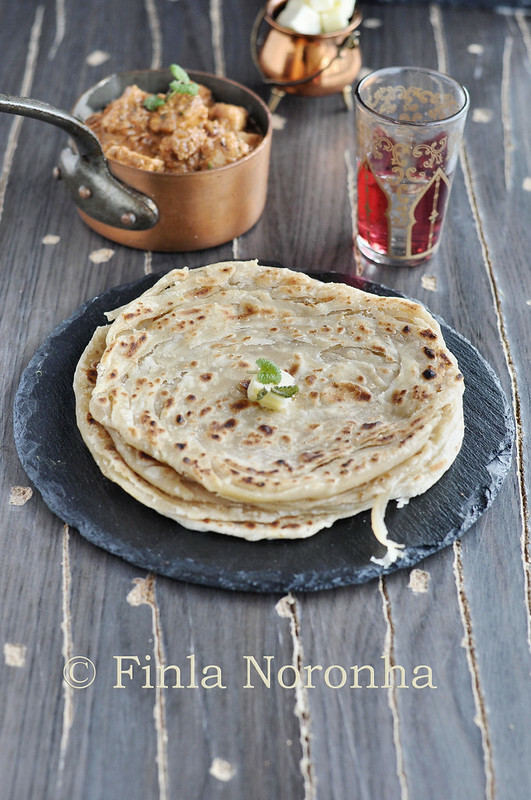 Place one paratha and when you see small bubbles coming up flip it over. Spead a little bit of butter/ghee each sides and cook un till both sides are evenly brown. 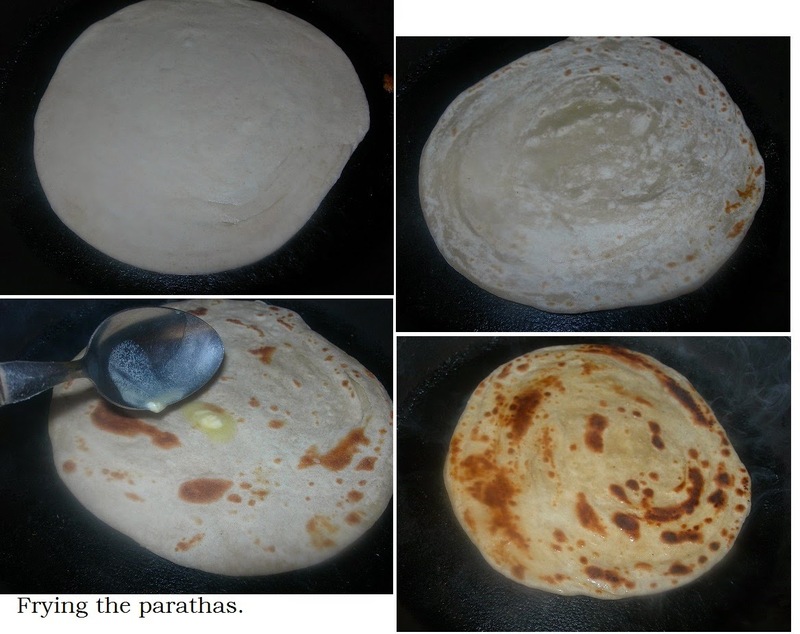 Transfer to a plate and keep it warm and make the remaining parathas. 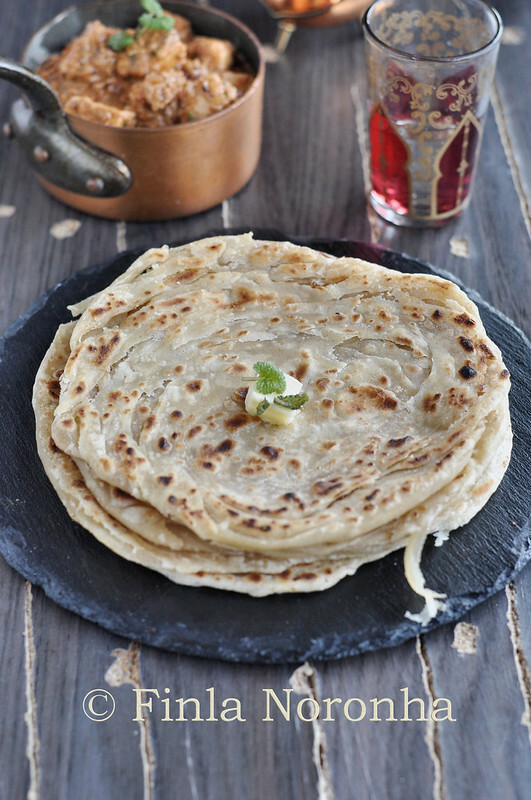 Pile all parathas together after making and press lightly with both hands. This makes them appear fluffy and it will show the layers. Paratha's look super flaky!! i can eat a paneer dish as such, never tried them with rice though and yes they are always a hit with some hot hot roti's!!! These look so much like the pancakes I ate as a kid. They look awesome, Finla. Hi Finla - this looks wonderful! I love how you dug up an old book and made good use of it. Sometimes I do that and find all these treasures in the form of great recipes. 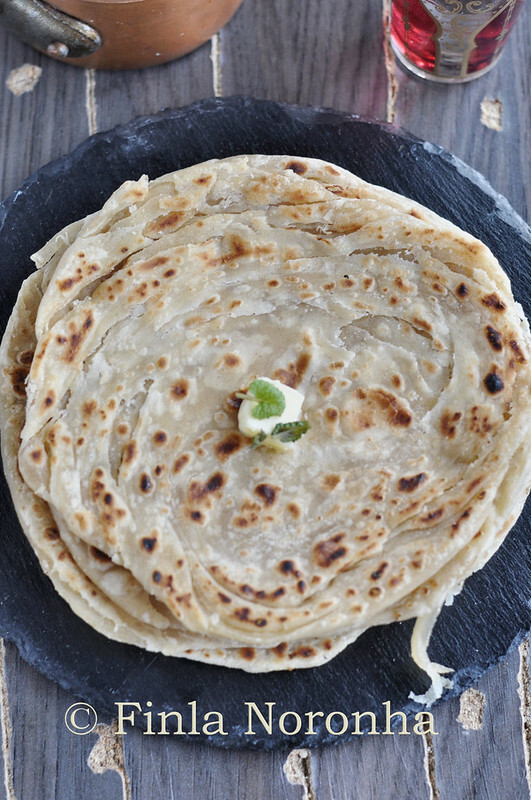 Your paratha looks delicious and it must have been some meal. How flaky they are, you are pulling me to make some..